San Diego is the global hub of triathlon: swim, bike and run. There are so many good training locations, it's can be overwhelming to choose when you first arrive. So, in this post we're going to cover the very best places to train for triathlon in San Diego. In our humble opinion, this is hands down the best triathlon training location in San Diego. An open water swimming Mecca, the 'Cove' is packed with triathletes. The best time to go is 6.30 AM on weekdays where you'll see the beach teaming with triathletes and swimmers. 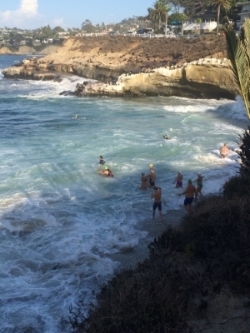 Ask any local: few people are happier than a swimmer who's just finished their swim in the cove. In the summer, the route from the cove to La Jolla Shores beach is marked with buoys from 1/4 mile to 1 mile. If you want a longer swim, head to Scripps Pier and back for a round trip of 3 miles. Temps go up to 72 F in the summer and you might not need a wetsuit until November (Temps drop to 59 in winter). This incredible bike loop begins at the Starbucks in Rancho San Diego and consists of 42 miles of serious climbing through quiet rolling hills. Not for the faint hearted, the first 20 miles includes 2500ft of elevation. Breathtaking descents with stunning mountain views last for over 10 minutes. Bring lots of hydration & fuel and go with a group who know the route. For an added challenge, add on various extra hills wherever you like! Two 50 m pools bordering the Pacific Ocean, right next to 3 miles of trails within the UCSD campus and miles of great biking. Pay for a guest pass or drop in for a masters workout for $10 with Coach Sickie and the UCSD Masters swim team. 8 miles of hilly trails hugging stunning views of the Pacific Ocean makes this an astounding trail running location. Pristine beaches and rare Torrey pine trees make this an experience not to be missed. Don't forget your water as it can get very hot! For a trail map, click here. San Diego has so much great biking its difficult to choose your route, but if your stay is limited, don't miss the views from the top of these cliffs. You can cruise down the main hill taking in stunning views of the ocean and surfers (in your peripheral vision obviously!) Head back up the hill for a tough climb. Best time to go is just after sunrise when there's hardly any traffic. Thanks so much for reading! What did you think about our favourite training spots in SD? Let us know if we missed any of yours.